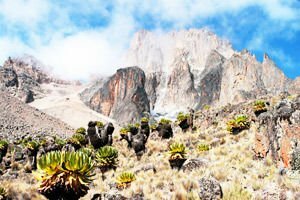 Declared in 1997 as part of world heritage by UNESCO, Mount Kenya is the highest in Kenya and second in Africa after the majestic Kilimandjaro. The highest peak reaches 5199 m and offers one of the most stunning views that you can see in East Africa. Kenya Nature Park is located south of the equator, 150 km northeast of the capital, Nairobi. The mountain was formed about 3 million years due to volcanic eruptions. For thousands of years the ridge and its slopes were covered with ice. Today from the center descends multiple eroded slopes and valleys. Currently, the small glaciers in the park are a total of 12, making Mount Kenya , a major source of water for the whole country. The main peak is surrounded by extensive mountain hills, which resemble more of the fields that are in the mountain areas. Its peaks are covered with forests and the lower parts create a feeling of nature untouched by man. However, the park has hiking trails built and cabins that are perfect for hiking. Around 15, 000 people a year visit this beautiful natural creation. Everywhere in the park of Kenya has beautiful large and small lakes and mineral springs. With increasing altitude the forests give way to vast areas with cedar trees and Padoa. To the highest mountain point occur only mosses and low shrubs. Wildlife abounds, but only up to 4000 m altitude. There are large African antelopes, zebras, elephants, bison, and in wooded areas that are undisturbed there are several monkeys. During the dry season the wildlife present from the lower parts are, leopards, hyenas, rhinoceroses, wild boars which climb to the high mountains. Especially, Mount Kenya is equipped for mountaineers and tourists from around the world. Local people call this huge peak, Kerenyi Niyaga, which means, Mountain of Light.